✟ ≠ 13624 Pte 6 East Yorkshire Regt. 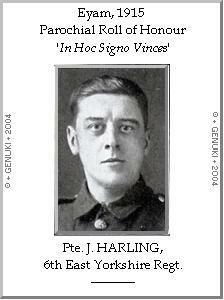 He enlisted 16/10/1914 in Sheffield. In July 1915 he was posted to the Balkans, where he stayed 12 months. Afterwards he was in France. In his service record is a note that information had been received by Mrs James Harling, Steeple House, Eyam, through the agency of the Red Cross at Geneva, relating of her husband, who had been missing since March 23rd last. 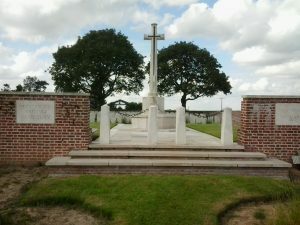 The letter reads as follows:- “we are grieved to inform you that the following report appears in an official German ‘list of the dead’ despatched from Berlin, July 1st 1918: ‘Harling J., 13624, 6th East Yorks, was killed and buried in a common grave 400 metres before the entrance of the village of Vraignes on the right side of the way. Date unknown”. 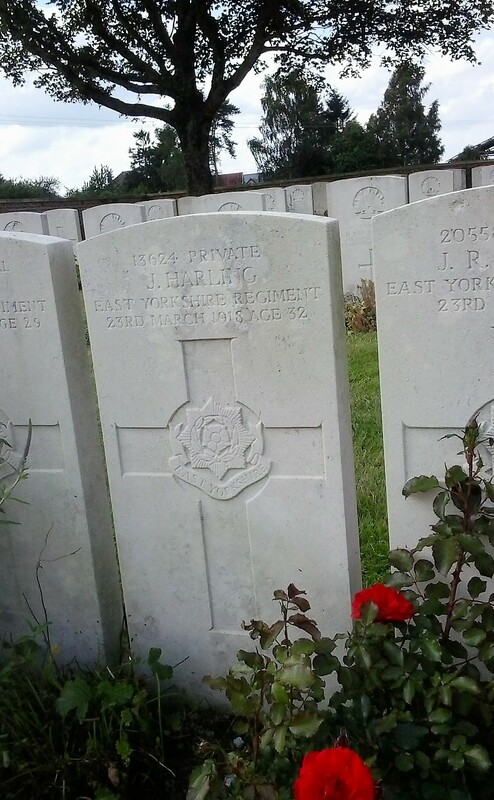 He was later reburied in Hancourt British Cemetery, France. (DC 5/10/1918, ‘One of the early volunteers, took part in Dardanelles Expedition. Reported missing last March, now confirmed KIA 29/3/1918’). He left a widow and one child. He was formerly in the employ of Messrs West and Son, boot manufacturers, Eyam. He is also commemorated on Eyam Memorial. b 1886 Sheffield, 1911C at Burch Place, Eyam and in the shoe trade. Brother in law to Joe Wilson, b Hathersage, as he married Joe’s sister Sarah, b Hathersage, on 30/12/1908. James’ death was reported on the same day as Joe’s, see below.